Market observers and gas traders are not expecting major disruptions to European natural gas flows in the increasingly likely case that the United Kingdom leaves the European Union without a new economic agreement. But the departure could create regulatory uncertainty, less efficient trading and price volatility. The beneficiaries of the no-deal Brexit could be gas exporters to Britain, including U.S. LNG producers, whose shipments there have surged in recent months. 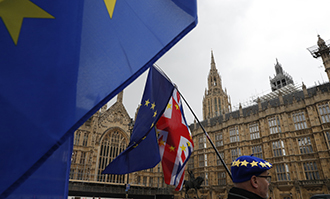 Anti-Brexit demonstrators hold flags opposite the Houses of Parliament in London, April 3, 2019. Once British gas pipelines go through economic separation from the integrated EU market, they could face regulatory retrofits, and shippers may see a divergence between major pricing hubs in the U.K. and the Netherlands. The uncertainty may lead U.K. gas buyers to lean more on imports of liquefied natural gas, testing the commodity's role in guaranteeing the security of supply for the U.K. and Ireland, said Thierry Bros, a senior research fellow for the gas program at the Oxford Institute for Energy Studies. "If you have a Brexit, and you have no idea what kind of regulation you are going to have with your pipes, then it is going to impact the flows in those pipes," Bros said. "It may not change overnight but it could change. And again, it is a risk that you don't face in LNG." The U.K. would be subject to World Trade Organization rules if it exits the EU without a trade deal. The EU does not impose tariffs or restrictions on LNG from nonmember countries. But the new arrangement would still entail a country-to-country regulatory adjustment between Britain and countries supplying natural gas by pipeline, including Norway, a non-EU member country, Bros said. Norway is the principal source of British gas imports, with Norwegian gas delivered by pipeline accounting for 70% of the U.K's gas shipments in 2018, according to U.K. government data. The remainder of the gas shipments came largely from LNG cargoes and pipeline flows from EU members Belgium and the Netherlands. Those gas flows would be largely unaffected unless an entirely new tariff system is introduced. Gas transportation capacity on pipelines supplying the U.K. is booked well past the date that Britain is set to leave the EU, indicating flows will continue. "In the immediate aftermath of a hard Brexit, it is nobody's anticipation that anything drastic is going to happen for the natural gas markets," said Leigh Hancher, a senior adviser at the international law firm Baker Botts who is an expert in EU energy law and policy based in Brussels. U.K. gas pipeline operators would no longer be bound by the EU's technical codes for running pipelines. It is possible that the operators would continue to follow EU energy market integrity and transparency principles in the interest of maintaining a secure gas supply, as nonmember countries such as Norway do. "On the U.K. front, they have always said they would try to make sure that in the interest of security of supply they would want to keep those pipelines operating, so that would mean they would have to just kind of shadow the EU," Hancher said. But hiccups are likely and, in the longer run, a technical operational divergence could make it more difficult to use pipelines, Hancher said. Moreover, the U.K.'s departure might lead to a scenario where suppliers such as Norway have an interest in maximizing the value of the natural gas molecules they export. This could reduce the status of the U.K. as one of the most liquid natural gas hubs in Europe, which has functioned as a place where LNG or Norwegian gas would flow in and then flow back into continental Europe or, if needed, staying in the U.K., Bros said. "It is going to be a bit of a mess — perhaps not overnight for those pipes, but in the longer term, yes," Bros said. U.S. LNG cargoes to the U.K. are picking up, according to the most recent data from the U.S. Department of Energy. The cumulative total volume of LNG exports that went from the U.S. to Britain since the U.S. released the first cargo from Cheniere Energy Inc.'s Sabine Pass terminal in 2016 grew from 13.3 Bcf in September 2018 to 65.1 Bcf at the end of January. 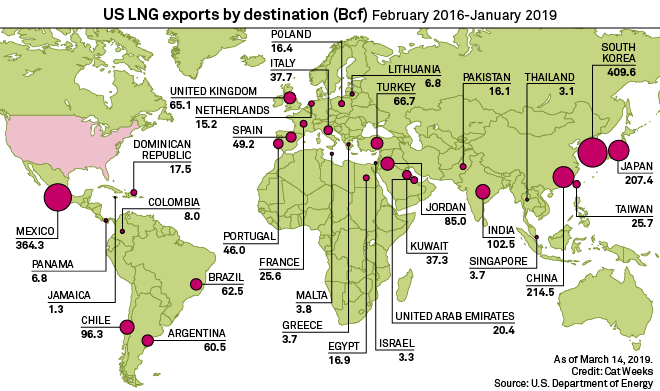 That trade is part of a broader trend of increased U.S. LNG shipments to Europe. Europe used to serve as a market of last resort for uncommitted LNG volumes, which historically could find higher prices in the Asian-Pacific region, but in recent months the EU has become attractive due to depressed prices in the Far East, among other factors. LNG imports in the U.K. are supported by domestic market forces, such as a delay in the country's efforts to replace its aging nuclear power plants. "The advantage of the LNG right now is that you have a lot available," Bros said. "And a lot on top is coming."